And that’s why she loves contemporary art. “Contemporary art is great because it’s open and has no limits. Hip hop is hip hop, but anything can be contemporary art,” she added. Ahn said that she has been dancing since she was born. There isn’t a dance genre that she hasn’t practiced and performed, nor did she experience difficulty choreographing singer Kim C’s song for the Infinite Challenge Freeway Music Festival. She defined contemporary dance as the dance of this era, but admitted that Asia is a follower of the West, and consequently, it is they who have defined it. Ahn unveiled her most recent choreography at the Beautiful Foundation’s 10th anniversary celebration on Nov. 12. Her work with the foundation revealed that she had collaborated with single mothers in the “Stores of Hope” project. Ahn traveled around the country to meet these single mothers who were working toward financial independence with the help of the foundation. She taught them how to dance and filmed their performances. 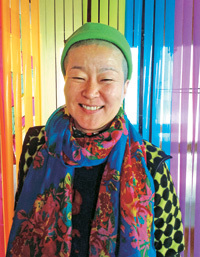 Ahn, who currently teaches at the Korea National University of Arts, said that while the act of dancing is about conversing with oneself, the act of teaching is about something even more valuable. “I couldn’t be happier when I’m teaching, when I’m changing people,” she said, smiling.